So, Do you want to install TWRP Custom Recovery on your Samsung device using Odin tool? Then, you have reached the right place. Here, I am going to give you the detailed guide to Install recovery using Odin on your phone. Odin is the multi-purpose tool which was used in service centers, and showrooms for flashing/updating the firmware of Samsung devices. Now, The Odin tool is used by all of us to flash ROMs and to install Custom Recoveries. So, We have to thank the growing technology. 0.1 What is the use of TWRP? What is the use of TWRP? TWRP is the Team Win Recovery Project and also an open-source Custom Recovery software which is developed for Android devices. It allows us to install Custom ROM’s, third-party developed apps and also helps in the installation of Root package to Root the Android device. TWRP is different from our normal Recovery image regarding interface and features. It provides a touchscreen interface where you no need of volume buttons to navigate to the options. So, this part is for those who don’t know what TWRP is. As I previously said, TWRP is the open-source recovery, and it can be available in two formats: Official and Non-Official. As it is an open-source project, anyone with basic knowledge can edit and replace it with their features. So, it will be better to use the official one rather than using the Non-Official TWRP file. Also, You can get the Official TWRP Recovery file from the official TWRP library. All you need to do is, Select your device Model from the list and click on that to download the file. There can also be missing of a few devices in the list; for those devices, You can search on the internet for the file and download it. Also, Make sure that the download TWRP Recovery file is in .tar format. Make sure that you have downloaded the newest version TWRP Recovery file for your device. Now, You can able to see Developer options in the settings. Click on that and Enable OEM UNLOCK. Now, You have to click on AP and select the .tar downloaded TWRP recovery file. Now, Click on the Start button and don’t make any changes in the settings on the Odin tool. It takes some time to finish. Once it gets finished, It will show the “Pass” message. Also, Look at your device. It will automatically restart the device. Now, You can disconnect it. To boot your device into TWRP Recovery mode, you need to follow the steps below. Now, Turn ON the device by pressing Power Key + Volume Down + Home button simultaneously for a few seconds. Then, It will show the TWRP interface. Now, you can do whatever you liked to do. I hope you liked the post on “How to Install TWRP Recovery using Odin.” Now, You can install TWRP on any Samsung devices by following the guide above. Also, Do let me know if you face any problem installing it on your device. 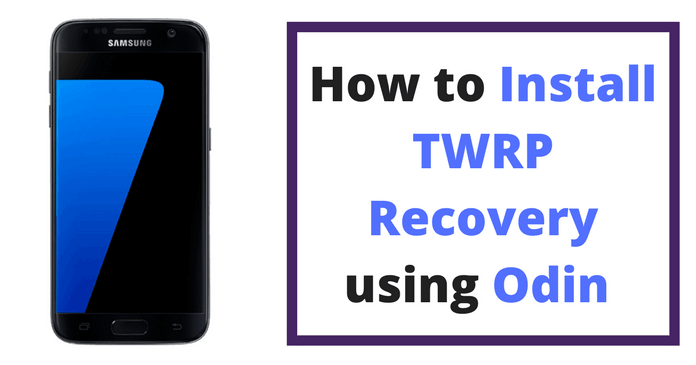 Do share this article with your friends and help them if they are facing installing TWRP Recovery.